“For over a decade, we have spent millions of hours building the largest encyclopaedia in human history. Right now, the U.S. Congress is considering legislation that could fatally damage the free and open Internet. 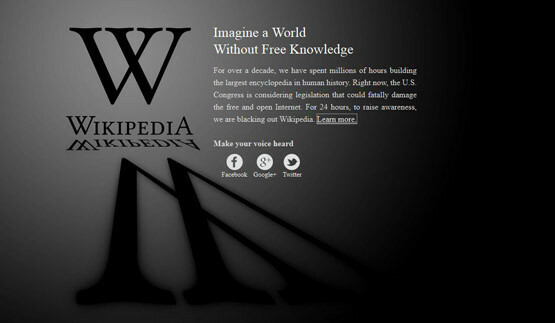 For 24 hours, to raise awareness, we are blacking out Wikipedia” and a page explaining why Wikipedians have chosen to protest SOPA with a blackout. The two bills in question before congress are ‘Stop Online Piracy Act (SOPA)’ and ‘Protect IP Act (PIPA)’. Both bills are supported by CNN (Time Warner Inc.) and other mainstream businesses who include, the Motion Picture Association of America, Sony, Timberland, and Juicy Couture, to name a few. If the Bills pass in congress it would enable copyright holders to lodge complaints against website owners and have them shut down. It would also mean that sites and Internet providers could be punished for hosting pirated content and held liable for an individual’s actions. public policy director Bob Boorstein at a conference last month. “It couldn’t function”, he added. Whilst companies such as Google and Facebook support the bills’ main goals, they do not support how it would affect law-abiding citizens and companies to new and uncertain liabilities that would almost certainly require monitoring and censoring websites. Many in the blogosphere and various groups are protesting the merits of the bill and with this action much attention and protest could water the down, or kill-off this intended anti-piracy bill altogether. There are many more companies not supporting SOPA and PIPA with some going public. A large number of the protesting sites requested readers to take action at the Stop American Censorship website. Google and Wikipedia are not the only sites to protest the PIPA bill. 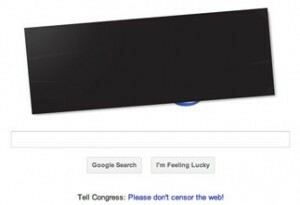 WordPress also placed a black strip across the top of the website that announced STOP CENSORSHIP. My daughter was shocked and dismayed that Burberry is one of the companies that are supporting the bill and vowed not to shop there anymore. Surely there are better ways of combating piracy than supporting Bills that could have wider effects on the web in general. It seems like a way to take control of the Internet and start dictating policy. We are glad Obama has turned his back on PIPA even at the expense of being shunned by the large movie studios for hand-outs at election time. Thanks for your thoughts and comment. Yes there are other ways and ideas that companies in the fashion and retail sector can implement to fight piracy and copying of their products without hurting the freedom of the web. As far as I know the intended SOPA legislation has been withdrawn and pretty much defeated due to the massive protest of Internet users. this is all about control. it’s about quieting people that disagree with Obama and the liberals. quieting anyone that don’t agree with the democrats. if they control our words, they can control us (so they think)… this is not American. it’s wrong. it’s a power struggle to keep power.